Royal Air Maroc is weighing whether global alliance membership will help attract more premium travellers and provide connectivity to other parts of the world. An alliance would benefit from RAM's position in Morocco but also central/west Africa, RAM's largest international market after Europe. RAM could use a premium push as incoming 787s prompt an increase in business class seats while RAM's long-haul markets prepare for growth. Sao Paulo will increase a little, while RAM expects to increase Montreal and New York JFK service to double daily over the peak summer 2015, although only New York is so far benefitting from this. Frequency and up-gauging will mean RAM achieves 53% higher growth at its peak in New York than in 2014. This expansion may prove too ambitious, as might a prospective Casablanca-Beijing service, RAM's first to Asia. Morocco is eager to receive Chinese tourists, but this may not be the way to tap the market. RAM planned to resume service to Dubai, but cancelled it – coincidentally or not – after Emirates increased capacity to Morocco. This is the second of a two part report on Royal Air Maroc. RAM will initially deploy its 787 on the Casablanca-Paris Orly route before bringing it to long-haul routes and other regional services. RAM will use the 787 to New York JFK commencing Feb-2015, according to the schedules it filed with OAG. From Mar-2015 RAM plans to mostly use 787s on the route with some 767 service. 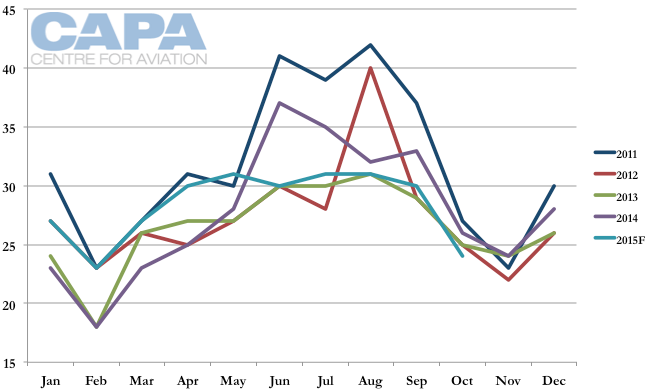 Frequencies, which have a strong seasonal pattern, will show strong growth from Apr-2015 when RAM operates 39 monthly flights compared to 30 in Apr-2014. In the peak Jul-2015 and Aug-2015 travelling seasons, RAM will operate double daily Casablanca-New York JFK services, 62 flights a month, compared to 40 monthly frequencies in Jul-2014 and 53 in Aug-2014. Growth will also occur through seat capacity as RAM's 787 seats 274 in a two-class 18 business/256 economy configuration. RAM's 767s seat 234-237 passengers, but each having only 10 business class seats, meaning the 787 will bring a large increase in premium seating. RAM has 20 business class seats on its 747-400, but the aircraft also has 478 economy seats – far more than the 787. Overall, the 787 represents about a 17% increase in capacity. The combination of increased frequencies and using the 787 will lead to a 53% increase on the New York JFK route based on Jan-2015 schedules. This growth is very ambitious and could take time to be absorbed. RAM has a relatively low profile. Delta and RAM ended their 12-year codeshare relationship in Jun-2012 with about a week's notice. In Oct-2012 RAM and JetBlue formed an interline relationship. Delta sells Morocco with connections on JV ATI partner Air France. 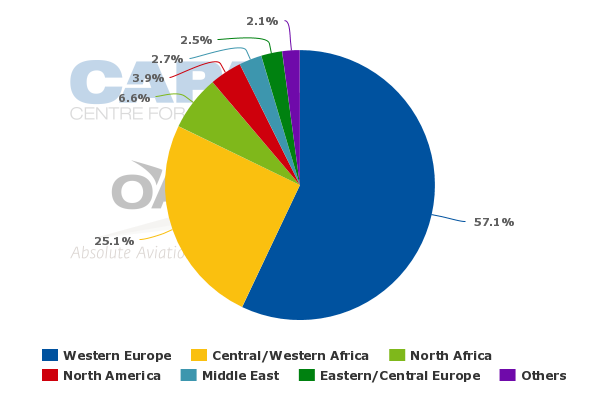 Data from OAG Traffic Analyser indicates RAM is carrying most of the New York-Morocco market but could look to take passengers from Air France, the largest indirect operator but still overall small. A larger opportunity would be to use the JetBlue partnership to grow across the US. Air France has a higher share of the non-New York to Morocco market than in the New York-Morocco market. RAM says about 50% of long-haul passengers connect beyond Casablanca. West African connections would be another growth opportunity. Before its restructuring RAM announced a service to Washington Dulles but this has not materialised. Washington is the largest US market to Morocco after New York but is about one-fifth the size of New York, according to OAG Traffic Analyser. Rather than opening a new station, which is costly, RAM may be better off focusing on New York, where partner JetBlue has its largest base. More recently RAM planned to re-open Casablanca-Dubai service from Mar-2015 with three weekly flights but in Oct-2014 cancelled this. RAM planned to re-open Dubai service in 2009 but also later cancelled the plan. RAM made its resumption announcement in Jun-2014 and in Aug-2014 Emirates announced it would increase Dubai-Morocco from daily to double daily effective 01-Sep-2014, and from 26-Oct-2014 would upgrade the additional A340-500 service to 777-300ER, providing a significant increase over what RAM's three-weekly 767 flights would have provided. This may have been too large a competitive response for RAM. Emirates is the only operator between Morocco and Dubai, but Qatar Airways and Etihad Airways also provide service from their respective hubs in Doha and Abu Dhabi. 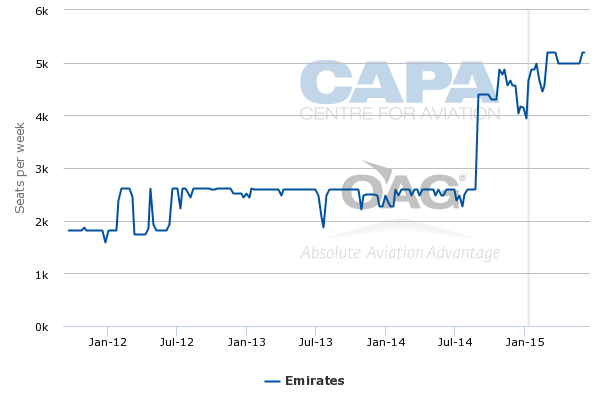 Emirates' growth in Morocco may have also been a result of Qatar's decrease effective May-2014. Elsewhere in the Gulf, RAM and Saudia provide Morocco-Saudi Arabia service. 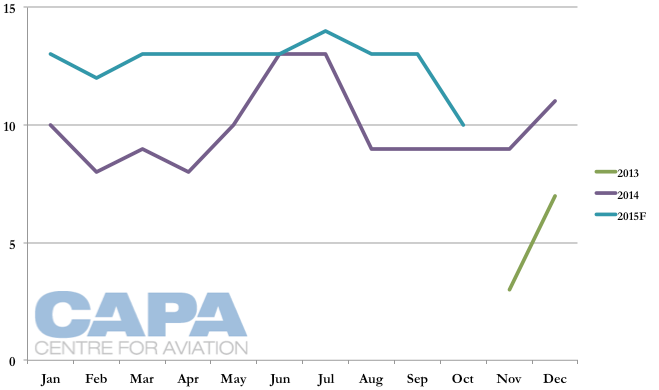 flynas briefly did during its scheduled long-haul phase. RAM's only other North American route is Montreal. RAM has made public comments that it intends to bring Montreal to double daily like New York JFK, but as of Jan-2015 this is not reflected in schedules. 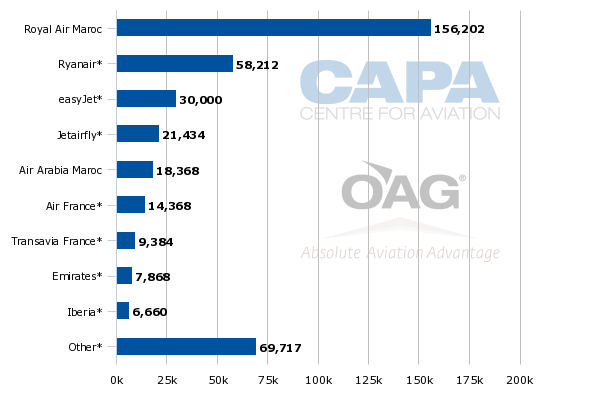 RAM's Montreal service frequencies will reduce year-over-year from Jun-2015, but increased use of the 747-400 and occasional 787 deployment will push capacity up about 2% up, according to OAG. Sao Paulo is RAM's third and newest long-haul route, having been launched in Nov-2013. The service will remain with 767 equipment but will increase year-over-year frequencies from Jul-2015 although it appears that in Oct-2015 RAM will start approaching its 2014 capacity levels. As of Jan-2015 data is not provided for after Oct-2015. RAM has discussed launching service to Asia, likely Beijing, in the medium term. But it appears these plans are being brought forward; Chinese reports quote the local Moroccan tourism office saying RAM will launch three-weekly Casablanca-Beijing services in Jun-2015. In 2015 Morocco plans to issue visas to Chinese travelling individually whereas other countries require a group visa, which limits visitor figures. Exact Chinese visitor arrival figures to Morocco are unavailable but have been described as being in excess of 10,000 in 2013. This is a very low figure for an airline to launch a new long-haul route. 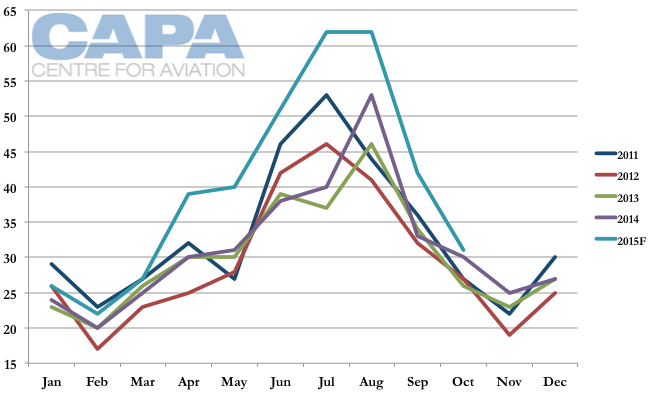 The Chinese market is price sensitive, a challenge for premium cabins, and is highly seasonal. Further, RAM is not known to have a local partner in Beijing; but even airlines that do have a local partner have sometimes found challenges in making the relationship work and attracting feed. Adding connections from Casablanca to elsewhere in Africa would likely provide only incremental traffic. With most of RAM's markets served less than daily, it will be challenged to offer convenient connections. Even on only the Beijing-Casablanca leg, RAM will compete with many low-priced one-stop services through Europe and the Gulf. The Beijing service is likely being pushed by the Moroccan government. It is unclear if the government will financially contribute to the Beijing service, as it does in the domestic market. 2014 tourism figures are unavailable, but in 2013 Morocco saw a 7% year-on-year increase to 10.05 million, crossing the 10 million mark for the first time. This was also the first significant growth since 2010. The intervening years were impacted by regional instability and terrorism fears. Over 66% of 2013's visitors were from France, Spain, Germany, Italy, the United States or unspecified Arab states. The balance is not broken down. Morocco wants to increase visitor numbers to at least 18 million by 2020. RAM is expected to decide in 2015 whether to join a global alliance. RAM's objectives are to increase corporate travellers (recall its 787 have a higher premium seat share) and gain better access to new markets, like Asia. Only 13% of the international capacity to/from Morocco is part of a global alliance, reflecting the large size of RAM and European LCCs, which are unaligned. SkyTeam has the largest share at 6.2%, mainly due to Air France's large size. 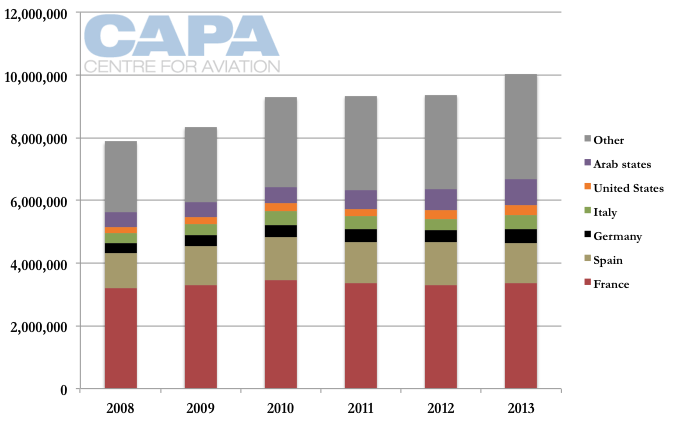 39% of Morocco's international seats are flown by LCCs, and this figure is the same in Jun-2015, a very different season for Morocco. The full service market is fragmented with only RAM, Air France, Emirates and Iberia being amongst the ranks of 10 largest airlines with international seats to/from Morocco. Alliances are also interested in an airline's connecting markets. RAM's recent upgrades to its Casablanca transit facilities boosts the possibility of connections, but these would likely be small figures. RAM's core international market is western Europe, accounting for 57% of seats, followed by Central/West Africa with 25%. This makes RAM more relevant to the West African market than its home North African market. RAM wants to grow further in Africa but there are no specific growth plans. This African component could be of interest to the alliances: the Europe-Morocco market is established, with a large presence from LCCs, but parts of Africa can be white spots to alliances. No alliance has a dedicated North African member (EgyptAir straddles Africa and the Middle East), or one from Central/West Africa, a market defined by large populations and often healthy yields but also limited access and few reputable carriers. 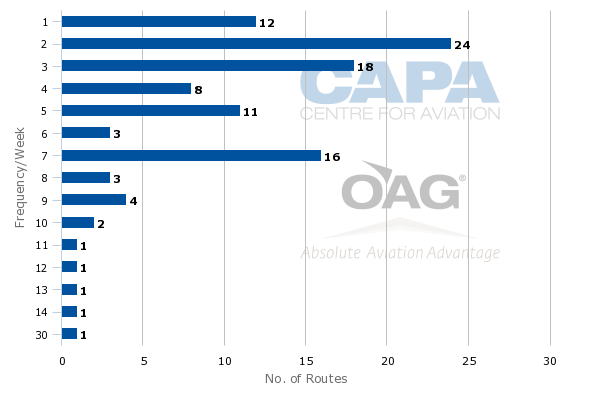 Looking at RAM's African destinations (and excluding capacity or frequency considerations), there is the largest overlap with Star Alliance. SkyTeam has large overlap too, although this is mostly due to Air France's extensive central/west Africa network. A number of destinations are served by Air France but not its local African partner carrier Kenya Airways. By way of comparison, many (but not all) Air France destinations that are not served by Kenya Airways are served by Ethiopian. Star Alliance is able to access African destinations via hubs in Europe, Africa as well as Istanbul, giving a range of connection options depending on the origin. SkyTeam in comparison has to often rely on Air France's Paris hub. oneworld is dependent on British Airways and Iberia's hubs, and to a lesser extent Qatar and Royal Jordanian. RAM would add many destinations to oneworld, although some of these could be added by Qatar Airways in future years. Even if Qatar served those markets in central/west Africa, RAM's Casablanca hub would have an advantage for European and North American traffic to/from central/west Africa; Doha would be too far east. 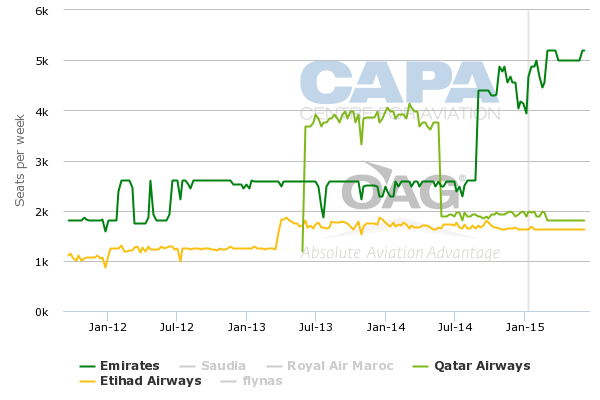 Qatar's Asian network, and planned growth, could be of interest to RAM. 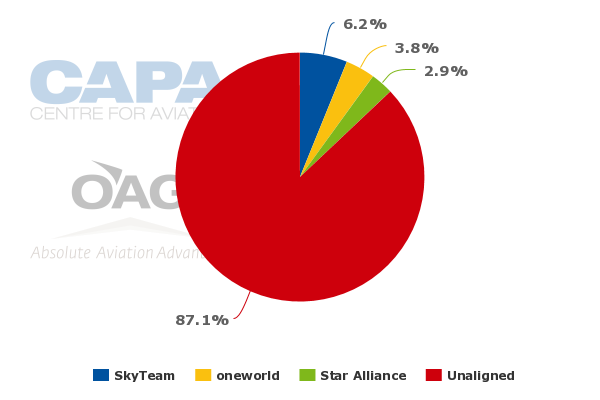 oneworld would gain its first African member and would have a member in every inhabited continent, joining Star Alliance. SkyTeam does not have a member in Australia/New Zealand. oneworld is the only alliance without an African carrier, although it has its own franchise operation in South Africa. France is RAM's single largest network by far, accounting for 33% of all international seats. Air France is also well-represented in RAM's core central/west Africa network. RAM would surely need Air France's blessing, and possibly a deeper relationship, to have a productive membership in SkyTeam. RAM in 2009 established a JV with Air France-KLM Engineering and Maintenance. This is a good footing but only a step to larger relationship. There would certainly be many options for RAM in Star, but those options may also give a feeling of over-crowding. RAM was able to successfully re-structure, in part due to the government allowing needed changes while paying for those (domestic services) RAM wanted to remove but the government did not. RAM had a difficult period but has emerged stronger and now is embarking on growth. However, this growth may be too aggressive, even with forthcoming low fuel prices (if they last – and are not negatively impacted by RAM's hedges). The Beijing service is a particular concern. Growth within Africa is appealing but African governments are notoriously protectionist, usually to their own detriment. Central and West Africa cannot boast a stable carrier for the region but RAM has the opportunity to carve a niche connecting this market to other regions. RAM's African presence would be appealing to a global alliance, as would RAM's recent product improvements on the ground and in aircraft. There is always the argument to remain independent from a global alliance and work with multiple airlines, but here the argument seems weak. RAM has few existing close partners (and thus little to lose) and Air France is not the friend it perhaps once was; it is far from the only player in the international Moroccan market, the domestic market is small, and central/west Africa can be accessed from hubs other than Casablanca. RAM would make a nice addition to an alliance, but does not provide critical access the way a prospective alliance member like Azul or IndiGo might. RAM benefits from its Casablanca hub's limited LCC competition, but this may not persist into the long term. Further cost cutting to create a more competitive short-haul positioning could also see RAM very selectively open more leisure routes. RAM is right to think the tourist market is not a large priority. Removing seats from aircraft is a curious move given how few airlines have been able to demonstrate strong yield premiums from more spacious economy cabins. Cost discipline married with revenue enhancements that can come from global alliance membership make an attractive position, and one that serves Morocco's economic objectives.